The "Online Travel Report 2007" of Baidu Data Research Center - Baidu is the leading Chinese search engine - which is based on data collected from browser cookies in Q4 2007 indicates that Ctrip is dominating the online travel market with a 51.65 percent market share. 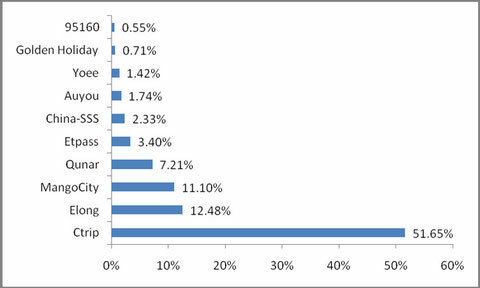 Elong (Expedia's exclusive affiliate in Asia) and Mangocity (owned by China Travel Online) lag far behind with a 12.48 and 11.10 percent market share. The China National Tourism Administration numbers the total revenue of the Chinese travel industry1,090 billion RMB (155.7 billion USD) for the year 2007. Online Travel booking currently has a share of RMB 2.25 billion (0.32 USD). 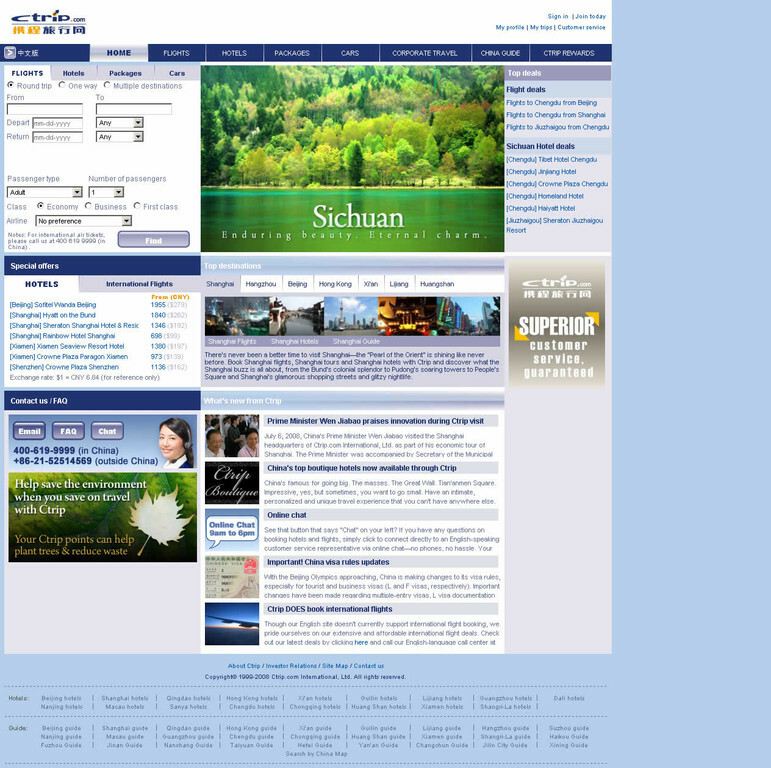 Ctrip is the leading travel service provider of hotel accommodations, airline tickets, and packaged-tours in China. The online service aggregates information on hotels and flights, and enables customers to make informed and cost-effective bookings. Ctrip also sells packaged-tours that include transportation and accommodations, as well as guided tours in some instances. The company targets primarily business and leisure travelers in China who do not travel in groups. These travelers form a traditionally under-served yet fast-growing segment of the travel industry in China. Since its inception in 1999, Ctrip has experienced substantial growth and become one of the best-known travel names in China. Impressed by Ctrip's leading position in the Chinese online travel market, Web2Asia has talked with Coley Dale, Business Development Manager at Ctrip, to learn more about the company's story of success. Ctrip has experienced substantial growth since being founded in 1999 and has become one of the best-known travel brands in China. It currently holds more than 50% of the online travel market. According to you, what are the key success factors upon this tremendous success in China is based on? The most obvious key success factor is Ctrip's customer service. We are leading in terms of understanding the needs of our customers and catering to them. Customer service has never been emphasized in China. The efficiency of our call centers is an important part of our success. How the company reacts to customers' demands is the way to establish success. There is also a focus on technology. We have found that Chinese consumers are more likely to book over the phone than online. The focus on our call center has been an integral part of our success. People in the US and Europe take customer service for granted, but it is a new concept in China. The key to Ctrip's success is its embrace of both technology and brick-and-mortar solutions. Of the two, the call center is by far the most popular. What do you think are the reasons for the preference of interaction with operators? We can see this behavior not only in online booking, but all other online services. We are aware of the preferences and have responded by making our call center as efficient as possible. Now we have one of the most efficient call centers out there - if a question can be answered in 30 seconds we want to answer it in 30 seconds. We do not want to waste our customers' time and we do not want to waste our own time. When calling Ctrip you usually get a live person on the phone within 30 seconds. In approximately 2-4 minutes we can have a booking done for you, that's something unique in China. For a new customer it is a little harder because you must register a new number and customer name. Once you have registered we greet you with kind "hello" and your name. We focus on the personal relation and as good and comprehensive services as possible, paying extreme detail to our call center, which requires a lot of monitoring. A real innovation was incorporating Six Sigma. We've been the first service company to implement Six Sigma in China. Ctrip launched a new English-language version of its website to make services easier to access for international users. Are there plans to expand the service range beyond China - the U.S. for example? We have launched the English version of the site to make it more accessible to foreign travelers and expatriates in China. We want the inbound business to grow as the market does - and the market is expected to do something great in the next years. China is expected to be the world's most traveled to destination by 2015. By 2020 China will have the largest outbound business worldwide. There are very big milestones ahead - the arrival of the 2008 Olympics in Beijing and the 2010 EXPO in Shanghai. These are not necessarily one -time events; we more see them as milestone. The inbound business will keep growing over the next few years at a high pace and the English language version is kind of an anticipation of the big milestones. Right now we mainly focus within China. We really just started, hoping to test the water and make sure out service levels are as impressive as the Chinese are. The underline theme is focus in customer service, which we are trying to express through media and public relations. We always try to tweak and modify our services and tailor it to customers coming to China. We are currently developing the international flight gateway supporting international flight bookings through the English language website. My operating group is very customer-focused. We want to target as many foreign customers as possible. In the future foreign travel to China will be a very significant part of our business. Ctrip is said to be the innovation leader in the Chinese online travel market with a very strong technology support and R&D. Can you give us some examples of those innovative products and advanced technology? In the Chinese market our innovative feature is service, commanded by our dedication to always put customers first. We are always ahead of competition in many ways in all our service levels. For instance, we are able to deliver tickets literally anywhere - when you book a flight, one of our delivery guys will meet you wherever you are. We can respond very dynamically to customer taste and have the ability to handle high volume in our call center. Our call center is the model of call center efficiency. Ctrip was the first service company to implement 6-Sigma in China. What can you tell us about the advanced service philosophy/service 2.0? Ctrip is led by a very talented group of executives. The executives have experience in this business; they have been around a while and are the driving force behind making the company more efficient. Our service and technology focus is evidence of it. 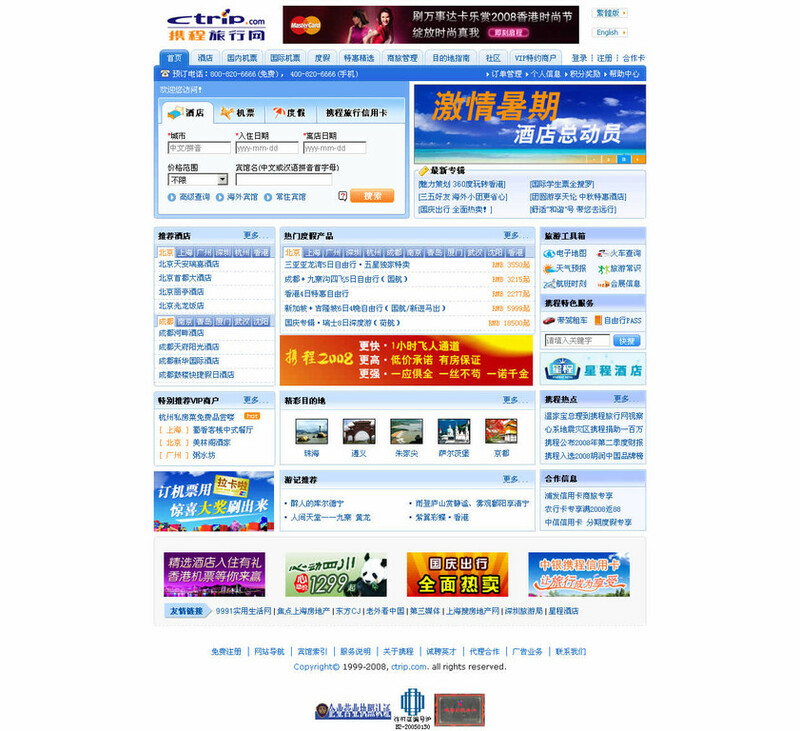 Ctrip is the leading company in the online travel industry in China. There is a huge market in front of us and we hope to dominate it in the future.